This is a creamy, hearty soup, perfect for a dinner soup. A great use for left-over cooked chicken. Be sure to salt and pepper well, to really bring out the flavours and don't skimp on the garnishes, as they add great flavour, as well. If soup thickens too much, or after refrigeration, thin with additional chicken stock. In a heavy large pot over medium heat, cook pancetta or bacon until crisp. Remove and set aside. Add butter and melt. Add flour and with a whisk, cook for 1 minute. Gradually add milk and stir. Add chicken, potatoes, corn, (carrots, if using) salt, pepper and a pinch of thyme. Bring to a boil, then reduce heat to low and simmer, stirring regularly, until potatoes are tender, about 20 minutes. Meanwhile, heat a bit of oil in a skillet over medium-high heat. Add 1/2 cup corn and cook, stirring, until browned. Set aside. Taste soup and add more salt and pepper, as necessary. If soup is too thick, thin with additional chicken stock. 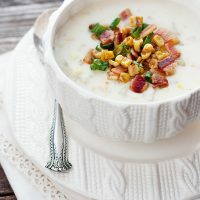 Spoon soup into bowls and garnish with reserved pancetta (or bacon), browned corn and green onion.